Mechanical Ventilation is one of the most important topics in all of medical education, especially in regards to Respiratory Therapy. With that being said, it can also be one of the most difficult subjects to study because of the complexity of the information. There’s no need to worry, however, because this guide was designed to make learning the ins and outs of Mechanical Ventilation easy for you. 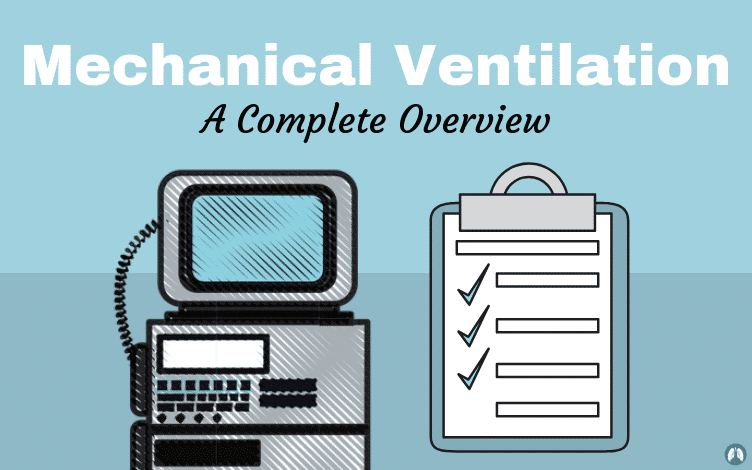 As you will see below, we have laid out almost everything that you need to know in regards to ventilators and everything you must learn in order to understand Mechanical Ventilation. Are you ready to get started? Then let’s go ahead and dive right in. Mechanical ventilation is needed for critically ill patients in intensive care units and is also a common therapy in subacute and long-term care settings. Mechanical Ventilation is used on patients who are unable to sustain adequate ventilation that is needed to maintain normal levels of gas exchange. Mechanical ventilation helps normalize arterial blood gas levels and acid-base imbalance by providing oxygenation and by removing carbon dioxide (ventilation). Mechanical ventilation can decrease the patient’s work of breathing by unloading respiratory muscles in a synchronous manner. Mechanical ventilation can also maintain long-term respiratory support of patients with chronic ventilatory problems. 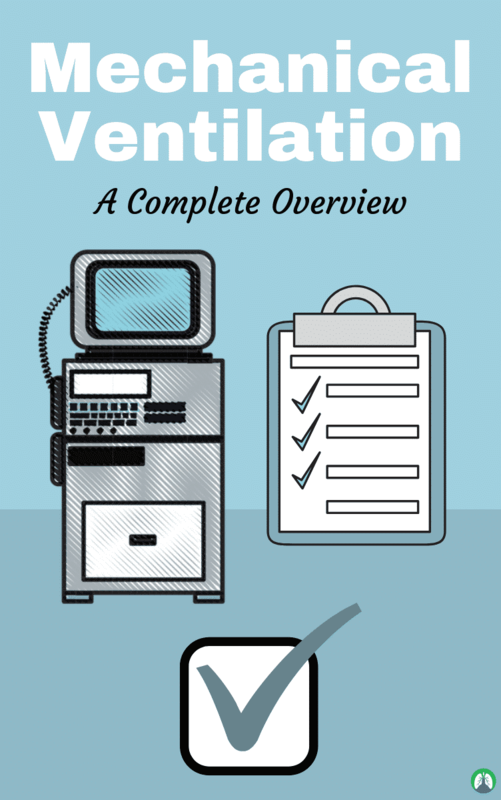 What is a Mechanical Ventilator? A mechanical ventilator is a machine that aids in a patient’s ability ventilate. In other words, their ability to take in oxygen and remove carbon dioxide. This machine is most often used for patients with breathing difficulties and those recovering from surgery or critical illness. While on a mechanical ventilator, a hollow tube connects the patient to the machine. A patient stays on a mechanical ventilator until he or she is able to achieve spontaneous breathing on their own. Mechanical ventilation is considered an invasive procedure because it involves placing an instrument (tube) inside the patient’s airway. It is important to keep in mind that the use of this machine does not completely heal the condition of the patient. Rather, it helps the patient achieve a stable condition while medications and other treatments actually promote healing. What are the Benefits of Mechanical Ventilation? Helps the patient get adequate amounts of oxygen. It allows medication to work while the patient heals. It helps the patient achieve stable oxygenation and ventilation. What are the Complications of Mechanical Ventilation? Barotrauma – This is a condition in which the tiny air sacs within the lungs known as alveoli, burst or rupture due to increased pressure. As a result, the lungs collapse and this can lead to very serious lung conditions that can affect breathing. In most cases, barotrauma is highly prevalent in patients with chronic obstructive pulmonary disease (COPD) that are receiving mechanical ventilation. Volutrauma – This condition occurs when the alveoli become filled with fluid due to high tidal volumes. Tidal volume refers to the amount of the air transported into the lungs when you inhale. Volutrauma commonly occurs in mechanically-ventilated patients who have acute respiratory distress syndrome (ARDS) and those who had a blood transfusion. Ventilator-Associated Pneumonia (VAP) – This condition is a form of lung infection induced by mechanical ventilation. Because mechanical ventilation often involves the insertion of tubes into the airway of the patient, there is a chance that various microorganisms can enter the lungs and cause infection. Ventilator-Associated Pneumonia can also occur when a mechanically-ventilated patient accidentally inhaled nasal secretions or gastric contents into the lungs. Intrinsic positive end-expiratory pressure/AutoPEEP – Intrinsic positive end-expiratory pressure, also known as AutoPEEP, is characterized by over-inflation of the lungs due to large tidal volumes, restrictive airways, or prolonged inhalation time. If left untreated, this condition can progress to barotrauma and collapsed lungs. 1. Intubation – This involves placing a tube known as endotracheal or ET tube into the mouth and down into the trachea of the patient to establish an airway. 2. Tracheostomy – A tracheostomy involves creating a surgical incision into the patient’s neck and inserting a tube into the patient’s trachea to establish an airway. This procedure is performed by the physician. Once a tube is secured into the patient’s trachea, the tube can then be connected to the mechanical ventilator. The ventilator works by blowing pressure (air plus oxygen as needed) into a patient’s lungs. With this process, the machine can do all the breathing or just assist with the patient’s breathing. 1. Insufficient oxygen levels – Inadequate oxygenation, known as hypoxia, can damage the tissues and other vital organs in the body if left untreated. Mechanical ventilation helps treat hypoxia by providing a sufficient amount of oxygen into the patient’s lungs that can then be distributed throughout the body to its tissues. 2. Inadequate ventilation – Mechanical ventilator helps the patient take in oxygen during inhalation and excrete carbon dioxide during exhalation. 3. Inability to protect the airway – Unconscious patients with breathing difficulties are at increased risk for aspiration. Aspiration occurs when the patient accidentally inhales nasal and oral secretions directly into the lungs. Establishing a patent airway and maintaining spontaneous breathing through mechanical ventilation can help prevent this condition. 1. Volume Modes – These modes work by delivering a set tidal volume. Assist-Control Ventilation (AC) or Continuous mandatory ventilation (CMV) – In this mode, the patient makes an effort to breathe while the mechanical ventilator assists by delivering a necessary mechanical breath. AC is contraindicated for patients who breathe rapidly because it may result in lung hyperinflation. 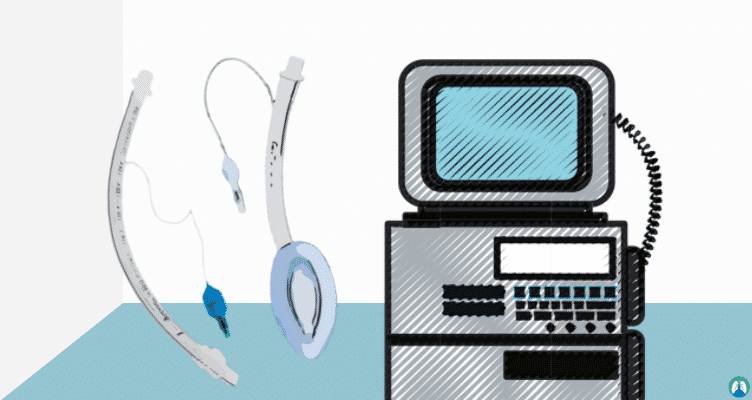 Synchronized Intermittent-Mandatory Ventilation (SIMV) – SIMV detects the patient’s inspiratory effort and provides a certain number of breaths depending on the set rate. For instance, if the set rate is 12 breaths per minute, the mechanical ventilator will provide 12 mandatory breaths in one minute while also allowing the patient to take spontaneous breaths between the mandatory breaths. 2. Pressure Modes – These modes work by delivering a set pressure. Pressure-Controlled Ventilation (PCV) – In this mode, ventilator provides constant pressure during patient’s inhalation. PCV is recommended for patients with neuromuscular disease but with normal lungs. 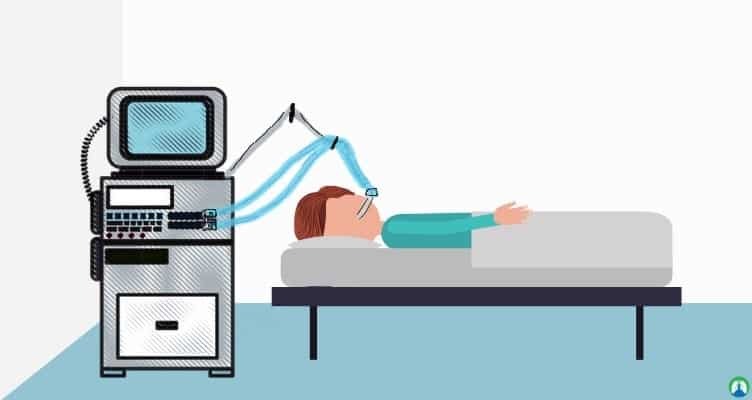 Pressure Support Ventilation (PSV) – This mode allows spontaneous ventilation by allowing the machine to deliver support while the patient regulates his or her own respiratory rate and tidal volume. Pressure Controlled Inverse Ratio Ventilation (PCIRV) – In this mode, the operator sets the time of inspiration to be longer than expiration. PCIRV is recommended for patients with ARDS. Airway Pressure Release Ventilation (APRV) – This unique mode of ventilation allows the patient to spontaneously ventilate at both low and high pressures. This mode of ventilation is recommended for ARDS patients as well. 3. Dual Modes – These mode work by allowing you to set the volume and pressure. Pressure Regulated Volume Control (PRVC) – This mode delivers constant pressure applied throughout inspiration, regardless of whether breath is initiated by the patient or an assist breath. 1. Tidal volume (VT) – This refers to the lung volume. VT represents the normal volume of air displaced during normal inhalation and exhalation when a patient does not exert extra effort during breathing. In young, healthy male adults, the value of VT is approximately 5–8 mL per pound of ideal body weight (IBW). 2. Respiratory rate (RR) – This refers to the number of breaths a patient takes per minute. Normally, healthy adults who are at rest have an RR of 12 to 20 breaths per minute. 3. Positive end-expiratory pressure (PEEP) – This is the pressure applied by the mechanical ventilator at the end of each patient’s breath to ensure that the alveoli do not collapse. Normally, the alveoli expands during inhalation to allow the air to come in. Gas exchange then happens as the blood flows past the alveoli’s wall. During each exhalation, the alveoli contracts in order to excrete carbon dioxide. In patients with impaired ventilation, PEEP reduces trauma to the alveoli by providing sufficient pressure during inhalation, and improves oxygenation by increasing the surface area for gas exchange and functional residual capacity. 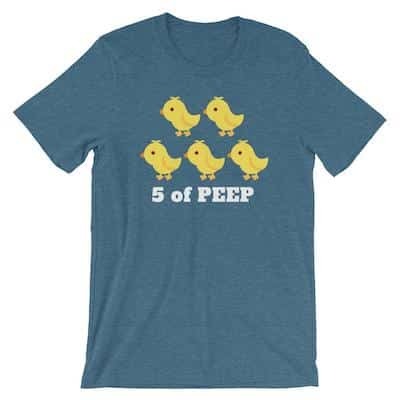 Speaking of PEEP, how cute is this ‘5 of PEEP’ T-Shirt? Grab one today from our online store! 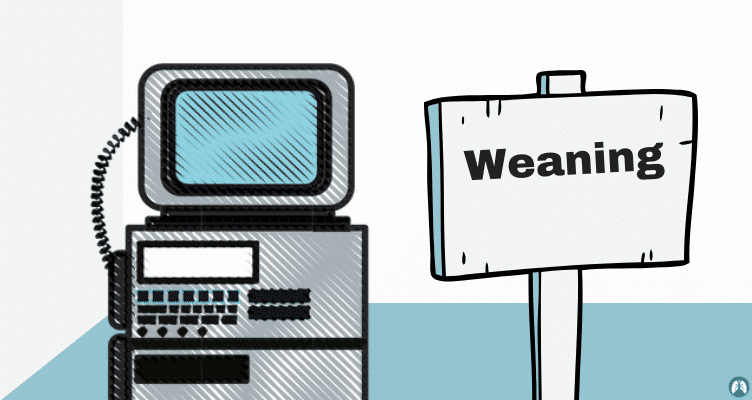 It comes in sweatshirts, tanks, hoodies, and coffee mugs as well. 4. Fraction of inspired oxygen (FiO2) – This simply refers to how much of the air a patient breathes is actually oxygen. Usually, FiO2 is set at 100% at the initiation of mechanical ventilation so that the patient receives maximal amounts of oxygen during the adjustment period and during initial attempts to achieve a stable condition. 5. Flow Rate – The flow rate refers to the maximum flow delivered by the mechanical ventilator during inhalation. It’s volume divided by time. Normally, flow rate of 60 L per minute or more is enough to stabilize a patient’s condition. A low flow rate can lead to dyspnea and other breathing problems. When the ventilator is in effect, it delivers air through the tubing to the patient. If an alarm occurs, this indicates that there is a problem with the pressure, volume, or rate of air being delivered. In most cases, the healthcare provider should assess the patient first prior to troubleshooting the mechanical ventilator. 1. 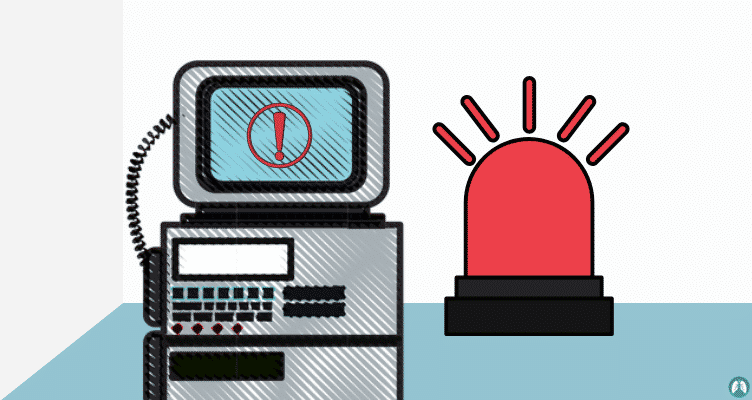 Kinked or blocked circuits or tubing – When an alarm sounds, the role of the healthcare provider is to immediately check the patient’s condition to assess the severity of the problem and determine the need for immediate resuscitation. If the patient is stable, the next step is to find kinked or blocked tubing that’s impairing air flow. Ventilator/circuit problems can be easily distinguished from ET/patient problems by disconnecting the patient from the ventilator and manually bagging the patient with a manual resuscitation bag. Accumulation of mucus or other secretions in the patient’s airway due to inadequate humidity. ET tube is disconnected from the ventilator circuit. Tracheostomy tube cuff is not well inflated. The patient requires higher levels of air than the mechanical ventilator is delivering. 4. Problems causing high and low rate alarms – High and low rate alarms can be caused by increases or decreases beyond the limit set for the alarm. A low rate alarm, or also known as “apnea alarm”, indicates that the patient has stopped breathing. This alarm is usually triggered by disconnected tubing. On the other hand, high rate alarm occurs when the patient experiences an increase in respiratory rate due to agitation or fatigue. 5. Problems caused by high and low inspiratory volume alarms – High volume inspiratory alarms can be caused by several factors such as leaking or disconnected tubes, increased respiratory rate, or increased demand for air due to pain, anxiety, or improper ventilator settings. On the other hand, low volume inspiratory alarms may be caused by accumulation of mucus secretions, tube obstruction, or a lower respiratory rate. What are the Common Drugs given to Patients Receiving Mechanical Ventilation? Although most patients tolerate mechanical ventilation via ET tube, some require intravenous (IV) administration of sedatives and analgesics (painkillers) to decrease discomforts as well as stress and anxiety. Evidence suggests that continuously administered IV sedation prolongs the duration of mechanical ventilation. Therefore, healthcare providers must use these medications with caution in order to achieve adequate sedation and prevent complications related to mechanical ventilation. 1. Epidural analgesia – Epidural administration involves injection of an anesthetic agent into the epidural space around the spinal cord. This route of injection blocks pain sensation by inhibiting nerve signal transmission in the fibers of the spinal cord. 2. Opioids – Opioids selectively work on neurons that transmit and modulate painful stimuli, leaving certain body functions such as sensation and motor function intact. While opioids are effective at controlling pain, dependence and withdrawal effects can occur with prolonged continuous infusion. The most common used opioids in mechanically-ventilated patients are fentanyl and remifentanil. 3. Morphine – Morphine is the oldest opioid used for relief of moderate to severe pain. This medication works by acting on the brain and nervous system to reduce perception of pain. One study even shows that continuous infusion of morphine in mechanically-ventilated patients reduces the stress response and promotes the human-machine coordination. 4. Benzodiazepines – Benzodiazepines belong to a class of anti-anxiety drugs. They work by enhancing the effect of the neurotransmitter (brain chemical) gamma-Aminobutyric acid (GABA), which in turn stimulates receptors that inhibit or calm down brain activity. Midazolam and lorazepam are the most commonly used benzodiazepines in mechanically-ventilated patients. 5. Propofol – Propofol is a short-acting sedative-hypnotic agent that causes a decreased level of consciousness and lack of memory for events. Just like benzodiazepines, this medication works by enhancing the effect of GABA receptor. 6. Dexmedetomidine – Dexmedetomidine is an anti-anxiety drug, sedative, and pain medication. This drug works by activating brain and spinal receptors which in turn relaxes the nerves, causes sedation, and reduces pain sensation. Unlike other sedatives, dexmedetomidine has the ability to provide sedation without risk of respiratory depression. However, it is not recommended for long-term deep sedation. Evidence suggests that the use of dexmedetomidine for sedation in mechanically ventilated patients can help reduce time to extubation and length of time in the intensive care unit (ICU). 7. Bronchodilators – Of course, as a Respiratory Therapist, you will most certainly administer bronchodilators to patients receiving Mechanical Ventilation. These can be given as a solution via nebulizer, or as an MDI (metered-dose inhaler). Both can be administered directly into the patient’s ventilator circuit. What Airways are used in Mechanical Ventilation? Without a patent airway, it will be impossible for the patient to be able to receive Mechanical Ventilation. Now let’s discuss the different types of airways that can and cannot be used with Mechanical Ventilation. Endotracheal (ET) Tube – a catheter (tube) that is inserted into the trachea (through the mouth or nose) for the purpose of establishing and maintaining an airway to ensure the adequate exchange of oxygen and carbon dioxide during ventilation. Tracheostomy (Trach) Tube – similar to an ET Tube, except the catheter is inserted directly into the neck through an incision (stoma). Double-lumen Endotracheal Tube – has two independent lumens or different lengths that allow you to ventilate the lungs separately. This airway is used for independent lung ventilation. Esophageal Tracheal Combitube (ETC) – a blind insertion airway device that is used in pre-hospital emergencies. This airway should be replaced with an ET Tube as soon as possible. Laryngeal Mask Airway (LMA) – a supraglottic airway that consists of an inflatable mask that fits directly over the opening into the trachea. It is used for short-term ventilation only when intubation is not possible. It is not intended to be used with Mechanical Ventilation. King Laryngeal Tube – a supraglottic airway device that is easier to insert than an ET Tube. It can be used in with positive pressure ventilation. 1. Endotracheal intubation – This is an emergency procedure performed in patients who are unconscious or have difficulty of breathing in order to maintain an open airway. During the procedure, the patient is given anesthesia and a flexible plastic tube known as endotracheal tube (ET) is inserted through the mouth and placed into the patient’s trachea (windpipe). The healthcare provider will then check the placement of the ET tube by listening to lung sounds using a stethoscope. Once the placement of the ET tube is determined, the healthcare provider will then secure it by introducing air into the small inflatable cuff of the tube. After a successful endotracheal intubation, the patient’s ET tube will be then connected to the mechanical ventilator. 2. Tracheostomy – This medical procedure involves creating a surgical incision in the neck of the patient (just below the Adam’s apple) in order to place a tube directly into the windpipe. A tracheostomy can either be temporary or permanent. The health care provider may hook up the tube to a ventilator if the patient cannot breathe on his own. The tube will be secured in place with a sterile band that goes around the patient’s neck. 3. Cricothyrotomy – This emergency surgical procedure involves the creation of a hole through a membrane in the patient’s neck into the windpipe in order to establish a patent airway during life-threatening situations. A tube will be then placed on the windpipe in order to maintain an open airway. If the patient cannot breathe on his own, the tube will be connected to a mechanical ventilator. What is Noninvasive Mechanical Ventilation? Noninvasive ventilation (NIV) involves the administration of ventilatory support without using ET tube or tracheostomy tube. This method has been used for several decades as an alternative method to invasive ventilation. NIV makes use of a sealed mask in order to deliver air to patients who cannot breathe on their own. Ventilator-associated pneumonia (VAP) is the most common healthcare-associated infection in patients in the ICU. According to studies, VAP increases the mortality of the underlying disease by 30%. The main causes of VAP are the formation of microorganisms within the ET tube and aspiration of mucus secretions. Because the ET tube is considered as a foreign body, it interferes with the normal protective upper airway reflexes, specifically coughing. This in turn results in rapid colonization of aerobic gram-negative bacteria. Once the secretions are contaminated, they slowly gain access to the lower airway through a fold in the wall of the cuff, resulting in infection. Therefore, the longer the duration of mechanical ventilation, the greater the risk of developing VAP. Is there any improvement in the patient’s underlying condition? Is the patient’s general condition optimal? Does the patient still exhibit any airway problems? Is the patient’s breathing adequate? 1. Pressure support – This method involves gradually reducing the level of pressure (decrements of 3 to 6 cm H2O) based on the patient’s respiratory rate. If the patient tolerates a minimal level of pressure support, the patient can be removed from the mechanical ventilator. 2. T-piece – This is a T-shaped tubing connected to an ET tube that is used to deliver oxygen in patients who no longer require the assistance of a mechanical ventilator. 3. Continuous positive airway pressure (CPAP) – This method involves administration of continuous pressure into the patient’s airways in order to keep them open. So there you have it! 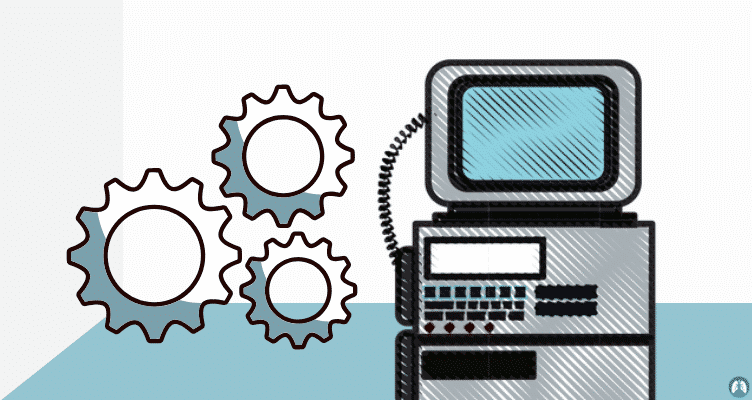 That wraps up our ultimate guide on Mechanical Ventilation. Again, this is one of the most difficult topics in the field of Respiratory Therapy but it’s also (by far) the most important. As a Respiratory Therapist, depending on where you work, you will deal with patients receiving Mechanical Ventilation almost every single day while on the job. This is one of the many reasons why you must know and understand the ins and outs of Mechanical Ventilation. And it is my hope that this study guide can help you do just that! Thank you so much for reading and I wish you the best of luck; and as always – breathe easy, my friend.